I felt it was only appropriate to play a BPD game in you honor. 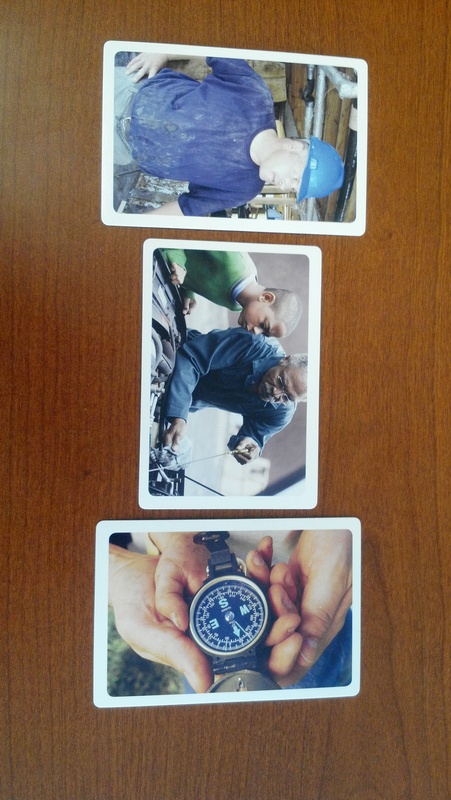 I picked three cards that I think demonstrate the perfect YMCA leader, but more importantly the cards that make me think of why you are the perfect YMCA leader. You are a great guy!!! I am really going to miss the energy you bring to the GHYMCA, you made our Y a special place. Among the many rewarding parts of being the Registrar at Camp Jewell YMCA is that I get to speak with our camper parents. This morning, I spoke with a camper mom whose daughter will be returning to Camp Jewell for Summer Camp 2013. Her daughter had joined us for the first time in 2012 as a 10 year old, and her mom had been very worried because her daughter was not particularly athletic or outdoors-y and rather shy. Mom had her doubts if her daughter would take to camp. Mom was very surprised that her daughter came home from camp so excited about Camp Jewell and all the really neat activities she had done here. She made so many new friends and tried so many new things. It was all she talked about for weeks, and still does. Her daughter is so excited about coming to camp next summer that she can’t wait for summer to get here. Mom was thrilled to see the change in her daughter and wanted to let us know what a wonderful time her daughter had and how thankful she is with our program and the wonderful counselors we have here at CJ. A tribute to our fantastic summer staff, awesome camping program, and super support team here at Camp Jewell! Like any day at the West Hartford and Tri Town YMCA, phone calls come in about registrations, questions, information about the programs and more. It is these phone calls that a small branch, like ourselves take each day to build a bond and trust with our members about their wants and need that our YMCA can bring to them. Pam Eisch, our business office manger is someone who communicates with many of our members through the phone and builds relationships with them everyday. We had two ladies come into the office and one was looking to register for our after school programs at our Tri-Town site. I had recognized the other lady who had accompanied her friend as one of our current parents from the after school program. I had mentioned to Pam who it was. They had many conversations through the phone that had them connected. She immediately walked over and introduced herself. The women had said to Pam, “its like we already know each other!” They had then exchanged a hug of kindness to each other and were so graciously happy to finally meet in person. It didn’t matter if they saw eachother each day in a program or at the office, they had grew a relationship through conversations just over the phone. It was the conversations and listening that had brought our staff closer with our members. No matter if you work in a facility with a welcome desk before you get to the fitness floor or a non facility with just an office space, you can build trust and friendship with your members in many ways! At last Wednesday’s board meeting, each board member was asked to bring a canned good for the local pantry. Rather than our usual “Impact Moment” given by a Y member or program participant, the board members were asked to share what they were thankful for. The only stipulation was that they could NOT say “my family”…since we presumed that they were all thankful for family. The responses ranged from “ability to give back, either financially or with time”, to “the friends and community that I’ve found at the YMCA”. Even the staff who were present gave input that reflected that they were thankul to have a job with a PURPOSE. Although the activity took time away from the meeting, it gave everyone an opportunity to share, and to learn something more about their fellow volunteers and staff. This afternoon I visited our Ellington SACC program at Center School. They were having their holiday feast (made up of mostly goodies donated by a local bakery). After the feast the children designed placemats for their Thanksgiving table plastered with items they are thankful about. Parents were welcomed to the program with a coffee, cider, and a donut and were asked to sit and play a game with their child and others. I was very impressed with the relationships that the staff were purposely creating with this display of thanks to the parents. While I was there at least half of the parents stopped, had a snack and played a game with their child or talked with staff. 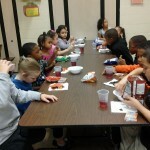 With almost 60 families enrolled at the program this was an incredible turnout. As we all celebrate this weekend with a day or two off, please stop to think about what you are thankful for. I am thankful for my wonderful family. I am also thankful that I love my job. Not many people can say they are part of an organization that puts its mission into practice each and every day for the good of the community. I wish to send out a very heart felt thank you to all the staff of the Indian Valley Family YMCA who work very hard each and every day to help raise the future leaders of the world. When Tiffany Ayala is at the welcome center, her sincerity and spirit welcome all who enter. Add those qualities to her ability to make those who feel more comfortable speaking spanish feel welcomed en español…WOW! When I hired Tiffany I noted her ability to speak Spanish on her application. I asked Tiffany if she would mind speaking Spanish when it would be better for the member. She was happy to do so and even created a sign in spanish that she puts out at the welcome center during her shifts! Her sign has helped spark several new conversations and most recently, set the stage for a full tour in Spanish! Spanish is not her first language, but her excellence in membership care puts the members first! ¡Gracias! Tiffany! 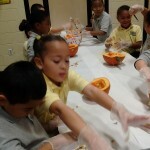 The East Hartford YMCA Mayberry School Age program decided for Thanksgiving activities to focus on families. and why we celebrate this holiday. 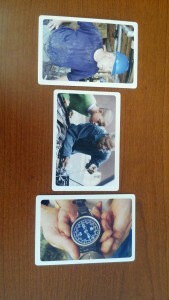 photos of their loved ones, what they are thankful for and what they like to eat. 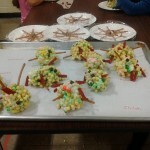 We also cut up our pumpkins which we had decorated for Halloween. The children separate the seeds for future baking. While they gutted the pumpkin, we talked about the first Thanksgiving and how hungry the Pilgrims were because they knew nothing about survival, and how the Indians gave them food, and taught them how to plant. 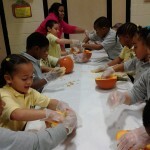 We explained how you can use ALL of the pumpkin for nourishment, including the skin, the pulp and the seeds. It was a great life lesson and they had so much fun! This past week, I had the honor of attending the Greater Hartford YMCA Heritage Club dinner. I love this event every year because it gives me a chance to reflect on what we as a movement do, and the legacy we want to leave long after we are gone. The speakers were powerful and inspirational to say the least. But for me, there was another key to the evening. It was the spectacular tangled web of relationships that I have been lucky enough to form over the years and how many of them were right there in that room Tuesday night with one thing in common…A belief in the mission, vision, and power of The Y! I was at the dinner with my wife who I met while we were Camp Directors together many years ago. As we walked in, we were greeted by Marvin Knighton who used to work with my sister at Aetna. During the cocktail hour, I caught up with the parents of a very good friend of mine from high school. They were brought into The Y fold first by Mike Sherman, as their youngest daughter was a counselor at Camp Woodstock. Later they were asked by a member of the Greater Hartford YMCA Board of Directors to fund a membership for one family a year that moved into a newly completed Habitat for Humanity house. While we were reminiscing about High School, Mike Sherman, former Executive Director of Camp Woodstock came to say hello to this family, inquired about their daughter, and caught me up on his own daughter who was a huge part of the East Hartford YMCA when she was a Child Care Director here with me years ago. It also turns out that my high school friend and I were classmates with the son of the Greater Hartford YMCA Board Chair and we just pieced it together. We sat at a table with a fellow Rotarian, and former Camp Jewell camper, who is a major donor to our SKC. His wife was the recent Interim Superintendent in East Hartford and was a huge supporter of our Y. She was also the Superintendent years ago in Glastonbury when my wife did her student teaching there. Across from me was a member of the Camp Jewell Board who I learned lives just a few streets from me in Granby. We talked about what the Y has meant to our kids and how lucky we are to have it. There were about 10 other really cool connections for me in that room the other night, but I think you get the idea. I left there knowing that the Y is much more than can ever be put into words. As I reflect on it, I think about my favorite movie, It’s A Wonderful Life. In the movie, George Bailey saw just how different people’s lives would have been had he never been born. I think about how different my life would have been had the YMCA never been “born”. In the end, The Y has brought me a loving wife, two wonderful kids, a career working for a cause driven organization, multiple friendships, Rotary connections, and experiences that could not be replicated anywhere else. This tangled web has become a part of who I am and I am very thankful for it. U.S. Paralympians Katie Holloway and Steve Serio made a visit to the Wilson Gray YMCA this week. They demonstrated their sitting volleyball and wheelchair basketball skills as well as shared their inspirational stories with local kids. It was amazing to realize how much they have accomplished after facing so many difficulties. Katie was born without a fibula in her right leg. When she was 20 months old, her right foot and ankle were amputated. But that didn’t stop her from doing what she loved. Katie was dual sport athlete while at theUniversityofCalifornia State Northridge. 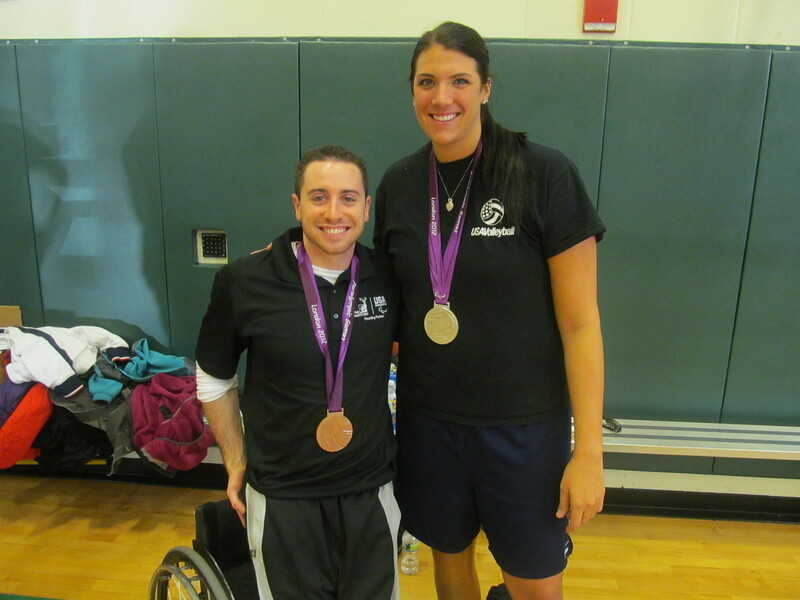 She received numerous awards and accolades as a member of the women’s basketball team and was a member of the National Paralympics Sitting Volleyball team, which has won the Silver medal at theBeijingand London Olympics. When Steve was 11 months old, he had surgery to eliminate a tumor on his spine. The procedure resulted in a compression of his spinal cord and paralysis. But he never let that hold him back. Steve earned a scholarship to play point guard for theUniversityofIllinoisat Urbana- Champaign Wheelchair Basketball team. He has played in the two previous Olympic Games, winning the bronze in London Olympics. He is also a professional player inGermany, having won 7 titles in the past 2 years. Needless to say, both of these athletes are simply amazing. Their stories and life lessons touched the hearts of everyone.